It’s not the stamp of approval. It’s more useful. Just in time to coincide with end of the year grading and my application for unemployment. Intrepid Adjunct Professors and Contingent Lecturers! How many times have you said to yourself, “I wish there were a way to quickly explain that I’ve just spent my entire semester engaging in free labor by grading piles of work for which I earn no money?” Plenty, right? Right! Help yourself to this original graphic, designed and supplied to Modern Disappointment by a bonafide adjunct instructor, and get busy stamping or digital “stickering” your next mound of student submissions. 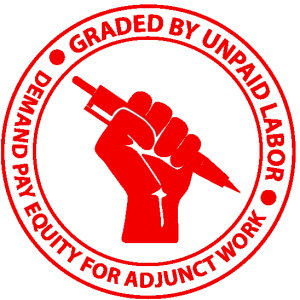 The Adjunct Grading Stamp graphic comes in red or black. But why choose one when you can have both! Share and get “likes” for your badassedness! Promote your feelings of dejection to your students and peers.